You can transition to natural hair for 5, 12, 24 or however many months you want, and your journey is still gonna be full of learning curves, happy discoveries, some surprises, and a lot of frustrations and doubt. 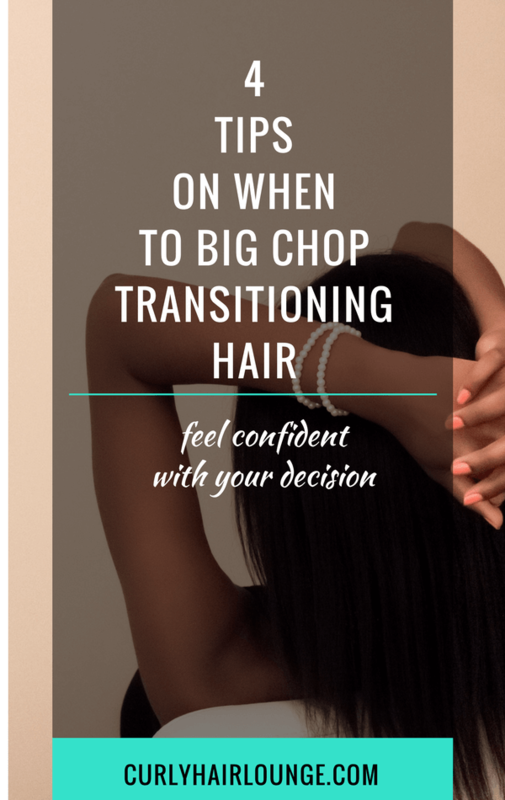 It’s certainly not an easy path to take and, among all this, you have to decide when to big chop your transitioning natural hair. Talk about pressure, right? There you are still trying to get knowledgeable and comfortable with your new hair texture and already people are asking you how long is this “thing” gonna last. I, for once, decided to set my Big Chop (BC) due date at a comfortable 2-year mark. For some people, this is way too long, but for me, I often questioned if it was long enough. You see, after having witnessed my hair go from waist to chin length on my first relaxer experience, you can understand why I became a little bit attached to my hair (you can read more about it here). The truth is, knowing when to big chop your relaxed ends is always gonna a personal and different decision to everyone. I believe most people stay within the 6 months to 1-year mark. This timeframe gives them enough time to meet and get acquainted with their new hair texture, and also to achieve some length. However, some may set a BC date and never reach it as taking care of two hair textures can become a Dantesque task, and in these cases, their BC date is usually brought forward. Did this happen to you? Focus – when you set yourself a date you get more focused on your goal and you don’t get distracted by a million other things. You are more intentional and driven in what you do. Plan – as you get more focused on your goals you tend to devise an effective plan (hair regimen) that will get you closer to it. Motivation – with a date set, your mind focused on your goal and a plan your motivation increases as you get nearer your due date. Results – with a BC date and a plan to reach your goals you can manage your time more effectively and focus on things that get you closer to your goal(s) and give you better results. Assessment– once your BC date comes it becomes easier to measure your results and progress during your journey and see how much you have improved. If you need help in setting hair goals and have no idea how to do that, you can download a free “Goal Setting Plan” I made for you on a previous post. Work through it to make your own plan. Click here and to have access to it. Alternatively, if you wanna plan with more detail for a longer period of time get a hair journal, the Ultimate One-Year Natural Hair Journal is perfect for that, check it out. Ok, so having a date for your big chop day and a plan to achieve your goal is all very nice, but what do you do when the day comes to cut off your relaxed ends and you don’t feel ready? Or what if you feel ready to do it and you still have a few months on the horizon? The simplest answer would be for you to postpone or bring forward your date, depending on how you feel about it. No one but you can tell you what to do. You have to feel comfortable with your decision. However, sometimes you can feel confused about how you feel about it. I remember that when I was transitioning there were days where I would feel ready to reveal my natural hair. I felt complete disregard for my relaxed ends and I just wanted them off, especially when I washed my hair and I could see my curls in all their health and glory (Precious, I tell you! 😀 ). But then, there were days where I felt comfortable hiding in the length of my hair. During my transition, my hair reached waist length and I enjoyed this milestone for the first time ever (well, since relaxing my hair). Does all this sound familiar? If you’re confused and don’t know which way to go, here are a few tips that let you know if you’re ready for the big chop or not. Taking care of transitioning hair requires work and time, especially because we practically live in protective styles. For some people, this extra work is tiring/tedious and takes the fun out of the journey. Many times you have to adjust your social life because you’ll need Saturday night to braid your hair. Well, if you’re losing your patience with all the prep and work it requires, and you rather do a quick wash and go and head out with your girls for a night out, then you should probably book a trimming session with your hairstylist. On the other hand, if you don’t mind a multi-step hair regimen that will take a couple of hours pre-pooing, shampooing, detangling, deep conditioning and then braiding or twisting, then you should wait until your big chop date. This means you’re getting more familiar with your hair and more skilled trying out different hairstyles. Do you find yourself trimming more inches off your limp ends or trimming them more often? If you do this, and you don’t miss the length, then you’re probably more focused on the health of your natural hair than holding on to damaged hair. You probably also keep imagining your hair 100% natural, and you’re more and more comfortable with this image. If this is you then you’re ready to BC. If your big chop day is getting closer, and you’re feeling anxious and nervous about losing your hair length, you definitely need to postpone your BC date. You should do whatever feels right for to you, and you should do it on your own terms and time. However, if you only have a couple more inches of relaxed hair, and you’re still holding on to them, you should ask yourself why is this so? Is it that you don’t see yourself natural yet? Are you still holding on to certain beliefs about length or natural hair? Think about this. Are you really committed to being natural? Hair health can be another decisive factor on whether you should bring your BC forward, or keep to your schedule. Hair breakage is not a strange event during your transition, in fact, it’s expected. When compared to your naturally curly hair your relaxed ends are too weak, and they can easily break at the line of demarcation. Although we take every effort to keep this to a minimum, with finger detangling, low manipulation hairstyles, sulphate-free shampoos or microfiber towels, sometimes hair breakage and thinning hair can become alarming. In these cases, it is best to simply cut off your relaxed hair. It may be a difficult decision to make, depending on where you are in your journey, but it’s a necessary one to make if you want to maintain the health of your remaining hair. If the decision to big chop your hair flares up negative emotions then you should continue your transitioning journey with no shame or guilt. If on the other hand, you feel curious, expectant, and even excited then you should go for it. Get rid of that dead weight! One important detail, though, if you wanna do your BC professionally, please find someone you trust, it’s very important you feel secure and confident. If you decide to follow the DIY route, be careful and make sure you use hair shears. Bottom line is, this is no race and there is no record to be broken. This journey should be enjoyed and savoured (as much as possible) and not rushed. Transitioning isn’t a race, there is no record to be broken! Do your Big Chop when it feels right, and feel liberated. How do/did you feel about your BC? Featured image credit: Dionysius Burton_IMG 0419 on Flickr (license).